I spent most of last week cleaning and organizing the downstairs. I cleaned out the media closet, which is a small living room closet in the space under the stairs. I filled bags with videos which EJ later donated to Goodwill, along with other items. Some of the videos were favorite movies, but we no longer have a video player so I averted by eyes and put them in the bags. I saw that the night-time temperatures were getting colder so I brought all the potted plants inside. I positioned them in front of various windows and then I spent several days repositioning them. They are large pots and heavy to lug around, but I have to make sure that plants that need more sunlight are put in places where they will get sunlight and I also have to leave some space for the cats on the wide window sills or they will lie on the plants. I had to put rocks in some pots to discourage the cats from lying in them. I also have to find the perfect place for my spider plant because for some reason the cats especially like to lie on it. Every autumn I bring a gorgeous spider plant inside and every spring I take a pathetic crushed spider plant outside on the porch to recover from cats. Some years I put the plant upstairs where the cats couldn’t get to it, but then I forget about it and it starts to slowly die of thirst. Last year I was able to put the plant in a place downstairs where the cats mostly left it alone. This year I brought in a peppermint plant, but I had to take it back outside because the cats were eating it. I think it’s related to catnip. If I remember, I will plant it in the yard before it gets too cold and hope it survives the winter. Mint plants seem to be very hardy. I only wanted it inside so I could have fresh mint instead of dried. Little by little I unloaded the tenth and last load of firewood from the truck. I stacked most of it in the woodshed but also brought some into the house. EJ laughed at me that I was hinting for a fire, but although I love the wood stove, I really brought it inside because I couldn’t see unloading it from the truck and stacking it in the woodshed when I’ll just have to bring some in the house soon anyway. I figured I’d save me a step. The temperature has dropped into the 40s at night and a few nights it dipped into the 30s. Mostly our house has stayed very warm, but on the coldest night we did build a fire in the wood stove. Late last week EJ came home sick from work. 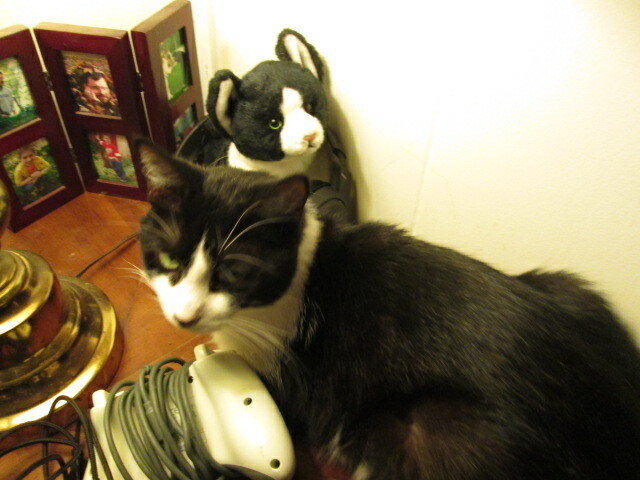 He is feeling better now, but JJ and I have been sniffling and sneezing a bit. I don’t feel too bad, but JJ seems to be feeling slightly worse. Today I was uploading some pictures from my camera to the computer. I have my pictures divided into files and organized by year. I thought I had deleted all my pictures from 2014. I couldn’t find them anywhere. I was felt terrible, feeling as if I had lost the memories of the year. But them I found them. Whew. I immediately copied all the pictures into a cloud drive thing. At least, I think I did. I don’t really know how it all works. 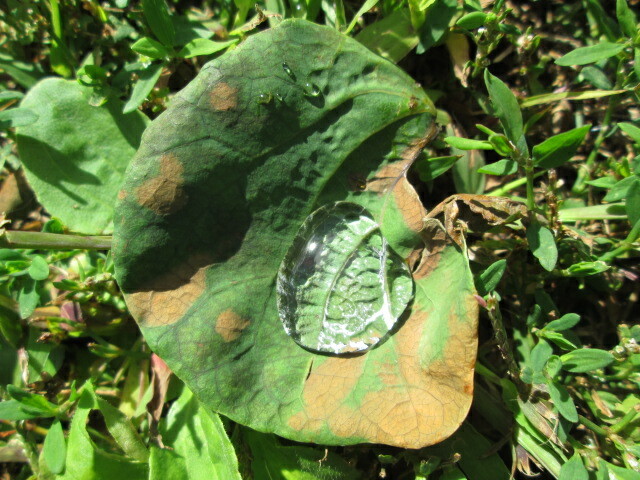 A leaf filled with rain or dew. Update: EJ said it was dew in the leaf and not rain. It sparkled in the sunlight so it caught our attention. Simone, it is not easy to switch over to a whole new set of holidays, although I love the Biblical holidays because they have so much deep meaning. We end up celebrating in different ways. Our first year, we celebrated the Feasts with friends who lived down the street. It was our first time doing it so I did all the research and I wrote out what everyone was to do and say, she organized the meals, and together we decorated. This friend moved away a few years ago. Another year I organized the meal and everything and invited a teenage girl to celebrate with us. The girl really loved it. Another year I celebrated on-line with a group of friends who studied together. On Rosh Hashanah this year, JJ has a CT scan and he has a appointments with his oncologist and to have his port flushed soon after that, so our celebrations will probably be very simple. That leaf is cool, love the matching toy!